Screenwriters: Matthew Stone and Anthony Tambakis, based on a story by Matthew Stone. Previewed at: Hoyts EQ, Moore Park, Sydney, on Friday 1 June 2018. Gringo, a black comedy from Australian director Nash Edgerton and featuring his brother Joel, is your classic fish-out-of-water set-up. It comes from the pens of US writers Matthew Stone and Anthony Tambakis and has a first-class cast headed by Charlize Theron, David Oyelowo, Thandie Newton, Amanda Seyfried and the aforementioned Joel Edgerton. What attracted such a high-power group of actors to a script by a couple of relative unknowns is a mystery. 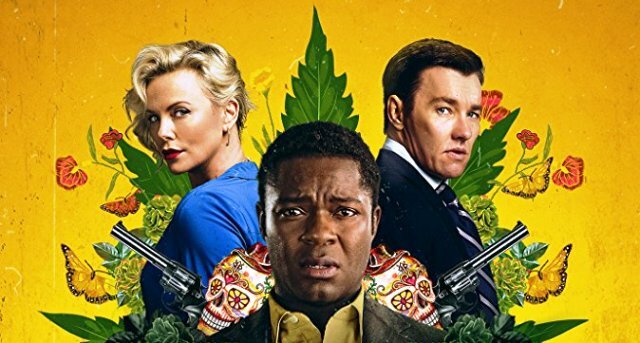 Harold Soyinka (David Oyelowo), a mid-level executive for a US pharmaceutical company is sent to Mexico by his bosses, Richard Rusk (Joel Edgerton) and Elaine Markinson (Charlize Theron), to check on the status of the company’s Mexican factory. It’s a trip he’s made alone many times before but this time Richard and Elaine inform him that they are coming too. When he’s excluded from meetings there, Harold becomes suspicious that there’s some subterfuge going on. Meanwhile, young lovers Sunny (Amanda Seyfried) and Miles (Harry Treadaway) are also heading to Mexico on holiday, although Sunny is unaware that Miles has a hidden agenda. Naturally, as always happens in movies like Gringo, these two sets of characters are bound to cross paths. Add in kidnapping, cannabis in tablet form, drug cartels, Richard’s ex-mercenary brother Mitch (Sharlto Copley), sexual duplicity and a lot of violence, and you’ve got all the elements of a top-notch drama, a heady brew of ingredients for a spectacle. What could possibly go wrong? Nash Edgerton says, “Most of my films tend to revolve around karma. You do bad things and bad things come back to you. For Gringo, I thought it would be interesting to make a movie about this guy who goes down this path, gets lost, and ends up finding who he really is.” Okay, but to my mind where he erred with this screenplay is in playing it for laughs - it would have worked better played straight. Think of some of the great film noirs featuring ordinary men and women thrown into extraordinary circumstances, like say Woman On The Run or North By Northwest, just two of many, and you understand that their success comes from the tension of their protagonist’s situation. Treating Gringo as an amusement detracts from the dramatic components of its story, and there are many, so that the viewer really isn’t emotionally engaged in Harold’s plight. You’re never left wondering if things are going to turn out alright for him. That said, there are some enjoyable parts of this film. The leads, of course, are all highly capable and attractive and the Mexican locations look great but, unfortunately, they’re not enough to keep you plugged in for 101 minutes. Gringo feels more like a tele-movie than a cinema release.